Grand Central Publishing, 9781455554935, 336pp. 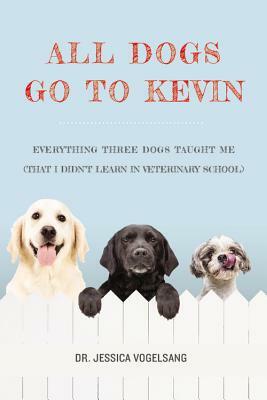 ALL DOGS GO TO KEVIN is a humorous and touching memoir that will appeal to anyone who has ever loved an animal or lost hours in James Herriot's classic veterinary stories. You can't always count on people, but you can always count on your dog. No one knows that better than veterinarian Jessica Vogelsang. With the help of three dogs, Jessica is buoyed through adolescence, veterinary school, and the early years of motherhood. Taffy, the fearsome Lhasa; Emmett, the devil-may-care Golden; and Kekoa, the neurotic senior Labrador, are always by her side, educating her in empathy and understanding for all the oddballs and misfits who come through the vet clinic doors. Also beside her is Kevin, a human friend who lives with the joie de vivre most people only dream of having. From the clueless canine who inadvertently reveals a boyfriend's wandering ways to the companion who sees through a new mother's smiling facade, Jessica's stories from the clinic and life show how her love for canines lifts her up and grounds her, too. Above all, this book reminds us, with gentle humor and honesty, why we put up with the pee on the carpet, the chewed-up shoes, and the late-night trips to the vet: because the animals we love so much can, in fact, change our lives. Dr. Jessica Vogelsang is a veterinarian, mother, and big-time dog person. Dr. Vogelsang worked in emergency and small animal medicine before settling into her current practice providing in-home hospice care for dogs and cats in San Diego. She is the founder of the website pawcurious.com, and her writing has been featured in or on Yahoo!, CNN, Ladies' Home Journal, People Pets, Outside magazine, and USA Today. "In a manner reminiscent of author/veterinarian James Herriot, Vogelsang shares stories of her canine patients and their human families with kindness and compassion...Vogelsang's experiences as a veterinarian, dog owner, mother, wife, and friend will resonate with readers, encouraging them to join her on a journey caring for others' pets-and to appreciate the unconditional love dogs shower on their human companions."